Call 604-420-7800 now to save $100 on your first 10-pack of Personal Training sessions! Check out the full list of Karp Fitness and Personal Training services! Have an injury to your back, shoulders or neck? There's no need to live with the pain. Visit one of our Kinesiologists today! 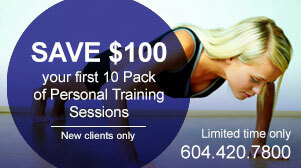 Call 604-420-7800 now to save $100 on your first 10-pack of Karp Personal Training sessions! Check out the entire archive of 'Ask an Expert' with Shaun Karp on Global TV! Karp offers the latest in Hockey Conditioning and other Sport-Specific Programs! Karp Fitness Blog: Your one-stop shop for exercise, fitness and healthy eating tips! Established in 1992, Karp Fitness is a leader in Fitness and Personal Training throughout Vancouver and the lower mainland of British Columbia. With our expert team, you can enjoy energetic workouts and custom nutrition plans designed to help you reach and exceed your goals. From general fitness and personal training to active rehabilitation and elite sport-specific programs, Karp Fitness can take your personal fitness to the next level. For everything Karp offers, check out our services page. With eleven locations across the greater Vancouver area and lower mainland of BC, Karp Fitness makes it easy and convenient to make your health and fitness a priority! Contact us today! For the Karp Fitness exercise guide, as well as the latest practical tips on general fitness and nutrition, visit the Karp Fitness Blog! To check out the updated library of Shaun Karp’s ‘Ask an Expert’ fitness segments on Global TV, visit the Video Archive! When Should Kids Start Weight Lifting?